YouTube makes money based on advertising revenues and paid memberships. Founded in 2005 by former PayPal co-workers (Chad Hurley, Eric Skaggs, Jawed Karim, Martin Pauer, and Steve Chen) YouTube was acquired for almost $1.7 billion in 2006 by Google. We don’t know how much revenues it makes, although it might be a $15 billion per year, based on advertising and paid membership. YouTube is the most popular website on the planet, after Google. How much money does YouTube make? Is advertising the right business model for YouTube? What does YouTube premium comprise? What does YouTube Music comprise? What does YouTube Originals comprise? What does YouTube Kids comprise? What does YouTube Gaming comprise? Going back and look at the YouTube story might be a good exercise to understand the wild success it experienced in a short period and how YouTube business model might look like in the future. This was the first inaugural video taken at the San Diego Zoo, for YouTube, the video-sharing platform which would become the most popular website – after Google – in a decade. As growth picked up right away, problems for copyrighted content loomed ahead. YouTube founders sat down with media executives to convince them of the value, in terms of business for them to be featured on YouTube. By 2010 YouTube recorded over two billion visits per day. Just five years before, the YouTube’s founders, former PayPal co-workers were sitting the whole night to go through the test and preparation of the video-sharing platform that would be acquired by Google, just 19 months after that night! At that point, YouTube had already over 2 billion views per day, way more than combined US networks. By 2012 YouTube would double that number. In 2012 YouTube kept consolidating its massive international expansion. YouTube is the most popular website in the world, after Google. With over 24 billion visits per month, according to Similar Web estimates, the video-sharing platform is extremely sticky. Since its acquisition from Google, YouTube revenues numbers were not disclosed, but according to Business Insider YouTube might be a $15 billion business in 2018. As explained on Google annual report “As interactions between users and advertisers change and as online user behavior evolves, we continue to expand and evolve our product offerings to serve their changing needs. Over time, we expect our monetization trends to fluctuate. For example, we have seen an increase in YouTube engagement ads, which monetize at a lower rate than traditional desktop search ads. Additionally, we continue to see a shift to programmatic buying which presents opportunities for advertisers to connect with the right user, in the right moment, in the right context. Programmatic buying has a different monetization profile than traditional advertising buying on Google properties. The advertising business model is not the only possible. As Netflix has been able to grow into a multi-billion dollar company with its subscription business model, also YouTube is experimenting with that. Formerly known as YouTube Red, YouTube Premium includes features across YouTube and the new YouTube Music app as well as access to all YouTube Originals series and movies. It comprises YouTube’s original series, and movies range from dramas featuring award-winning actors to comedies with top YouTube creators and documentaries covering multi-platinum artists. With YouTube Premium, you have access to all YouTube Originals, available to watch on all devices. You can find the list of movies and series on the YouTube Originals channel. YouTube Gaming filters videos from YouTube to give you the best experience for watching gaming videos. You’ll find everything that’s in YouTube Gaming on the main YouTube app/site, but only gaming content on YouTube Gaming. We cannot know how many YouTube paying members there are. However, YouTube is pushing on its paid memberships. With an ad-free and offline library, YouTube music premium and the YouTube originals, the video-sharing platform might well be able to compete with Netflix, Spotify and others media companies running on top of the subscription-based business model. Founded in 2005 by a group of former PayPal employees, YouTube grew so fast that by 2006, in about 19 months after it got acquired by Google for almost $1.7 billion. Ever since YouTube has kept its pace and it has become the most popular site on the planet after Google itself. 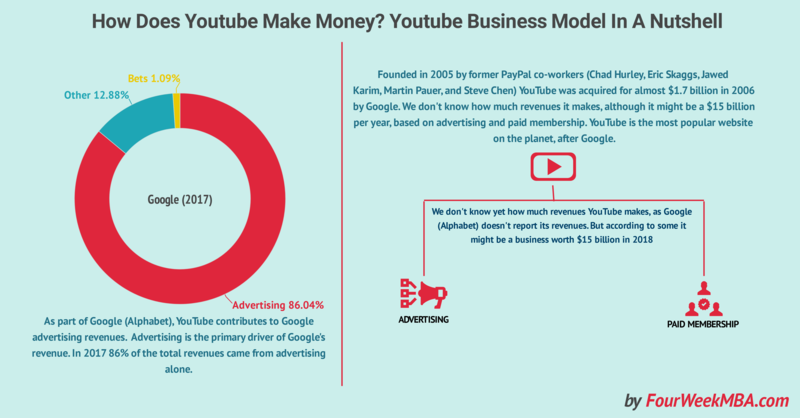 Since YouTube is part of Google’s financials we don’t know yet its revenues. Yet as pointed out on Business Insider that might be a business of $15 billion per year. This scenario might change soon if the SEC will ask Google to report YouTube revenues. Advertising is the primary revenue source for Google and presumably for YouTube as well. However, YouTube is also experimenting with the subscription business model.